Land once sought for Port Columbus International Airport has emerged as a focus for economic development in Gahanna as the city prepares to open an $8.2 million extension of TechCenter Drive in November. Central Ohio Urology is moving about 15 doctors and 70 employees to offices it will build in Gahanna. The 114 acres owned by Andre Buckles already have drawn a planned 40,000-square-foot office building and city park, leaving about 80 acres for further commercial development between Interstate 270 and Hamilton Road. Construction of the TechCenter bridge and lanes through the Buckles land will improve access to I-270 for businesses in the Officenter and Central Park developments east of Morrison Road where TechCenter now ends. Buckles in the 1990s sold land along the east edge of Morrison Road for the Officenter park, distributation center projects, hotels and restaurants. Columbus developer Tim Spencer of Trivium Development LLC already has put about 12 acres along the south edge of the development in contact. 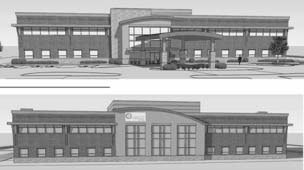 In early September, Central Ohio Urology Group Inc. revealed plans to consolidate its administrative staff, outpatient surgery operations and other functions at a Class A office property on 2.9 acres. The developer has in interest in acquiring more property but has yet to identify retailers or other office tenants. He said he can’t buy all of the land. Port Columbus in 1998 sought to buy the Buckles property through eminent domain. Hamman said the airport valued the land at about $3.5 million, but a jury valued the property at $13.5 million. Soon after the verdict, airport officials abandoned their bid to acquire the land. Gahanna’s economic development director, Anthony Jones, said completion of the Techcenter bridge and road expands the suburb’s options. The Central Ohio Urology project, he said, offers an example of how office development can continue along I-270. Hamman said the cooperative spirit the city demonstrated in getting the road built prompted Buckles to donate about 35 acres to the city for the expansion of a park. Buckles has farmed the land for 50 years, Hamman said, and sees no need to sell the property quickly.